Legacy Library: George Smith Patton, Jr.
GeorgeSPatton is a Legacy Library. Legacy libraries are the personal libraries of famous readers, entered by LibraryThing members from the Legacy Libraries group. » George Smith Patton, Jr.'s catalog. 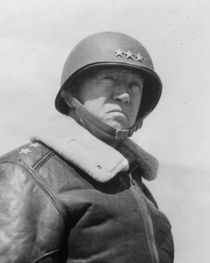 » George Smith Patton, Jr.'s legacy profile. GeorgeSPatton is also an author. All my life (or should I say lives?) I knew that I was born to be a soldier. My family maintained an American military tradition from General Hugh Mercer in the American Revolution through my son, George Smith Patton IV, in Vietnam. I began my military education as a young boy by reading classics like those of Thucydides and Herodotus. This self education continued throughout my life, and I died with one of the most extensive military libraries of anyone in the world. 1885, November 11: Born, San Gabriel, California. 1903-1904: Attended Virginia Military Institute, Lexington, Virginia. 1909: Graduated, United States Military Academy, West Point, New York. Assigned to Fifteenth United States Cavalry, Fort Sheridan, Illinois, and Fort Myer, Virginia. 1910: Married Beatrice Banning Ayer. 1912: Member, American team, V Olympiad, Stockholm, Sweden, finishing fifth in modern pentathlon. 1912-1913: Attended French cavalry school, Saumur, France. 1913: Graduated, United States Cavalry School, Fort Riley, Kansas. 1913-1915: Instructor in weapons, United States Cavalry School, Fort Riley, Kansas. 1915-1916: Assigned to Eighth United States Cavalry, Fort Bliss, Texas. 1916-1917: Aide-de-camp to General John J. Pershing, Mexican Punitive Expedition. 1917: Aide-de-camp to General John J. Pershing, Commander-in-Chief, American Expeditionary Forces. Commanded Headquarters Troop, American Expeditionary Forces. 1917-1918: Detailed as first member of American Tank Corps and attended French Tank School, Camplieu, France. Organized American Tank School, Langres, France. 1918: Promoted to temporary rank of lieutenant colonel. 1918-1921: Commander, 304th Tank Brigade. 1919-1921: Invented a coaxial gun mount. 1921-1922: Commander, First Squadron, Third United States Cavalry, Fort Myer, Virginia. 1923-1928: United States Army General Staff, Boston, Massachusetts, 1923-1924; Hawaii, 1924-1928. 1928-1931: Served in Office of the Chief of Cavalry, United States Army. 1932: Graduated, United States Army War College. 1932-1935: Executive officer, Third United States Cavalry, Fort Myer, Virginia. 1934: Promoted to lieutenant colonel. 1935-1937: G-2, United States Army General Staff, Hawaiian Department. 1938: Promoted to colonel. Commander, Fifth United States Cavalry, Fort Clark, Texas. 1938-1940: Commander, Third United States Cavalry, Fort Myer, Virginia. 1940: Promoted to brigadier general. 1940-1941: Commander, Second Armored Brigade, Second Armored Division, Fort Benning, Georgia. 1941: Promoted to major general. 1941-1942: Commander, Second Armored Division, Fort Benning, Georgia. 1942: Commander, I Armored Corps, First and Second Armored Divisions. 1942-1943: Commanded Western Task Force during Allied landings and subsequent campaign in North Africa. Transferred to command of United States II Corps. 1943: Promoted to lieutenant general. Relinquished command of II Corps to Omar Nelson Bradley. Resumed command of I Armored Corps in preparation for invasion of Sicily. 1943-1944: Commanded Seventh United States Army in Sicilian campaign. 1944: Ordered to England to take command of Third United States Army in preparation for invasion of France. 1944-1945: Commanded Third United States Army in drive across France, Germany, Czechoslovakia, and Austria. 1945: Commander, Fifteenth United States Army. 1945, December 21: Died, Heidelberg, Germany. Biographical timeline from George S. Patton: A Register of His Papers in the Library of Congress. About my libraryMy library has been cataloged by LibraryThing members sergerca and BOB81. The books of my extensive library are from the excellent book The Patton Mind: The Professional Development of an Extraordinary Leader by Col. Roger H. Nye. 1. Selected contents from my home library (circa the late 1940s) in South Hamilton, Massachusetts. 2. My collection housed at the United States Military Academy Library. Real nameGeorge Smith Patton, Jr.